A new photography exhibition, Gibson Through The Lens, featuring an amazing line-up of prints of guitarists past and present by some of the finest rock photographers in the world, opened at the British Music Experience in London yesterday (7 November). Among the stellar list of guitarists featured are the likes of Jimi Hendrix, Jimmy Page, Angus Young, Eric Clapton, Keith Richards, B.B. King, Dave Grohl, Jeff Beck, Les Paul, Chuck Berry, Pete Townshend, Kurt Cobain, Jack White and Noel Gallagher. 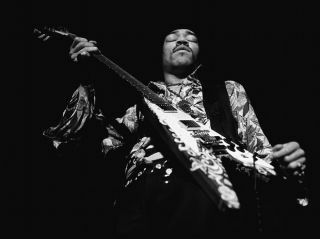 The photographs are the work of some the world's leading music photographers, including the likes of Mick Rock, Ross Halfin, Baron Wolman (that's his Hendrix image above), Neal Preston, David Redfern and Jim Marshall (not THAT Jim Marshall). In addition, Gibson is hosting a series of masterclasses with the featured photographers throughout the exhibition period, the first of which will be with Baron Wolman this Thursday (10 November). The exhibition will run until 31 January at the British Music Experience, located in London's O2 Arena, and those visiting Gibson Through The Lens will gain discounted entry to the rest of the British Music Experience exhibit.